Calathea (Calathea spp. ): growing, planting, caring. Calathea is a very decorative houseplant and has a wide variety of different colors and shapes! Scientific name : Calathea spp. Calathea is a genus of plants belonging to the family Marantaceae, with several dozen species in this genus. Native to the tropical Americas, many of the species are popular as pot plants due to their decorative leaves and, for some species, colorful inflorescences and all are commonly called calatheas. 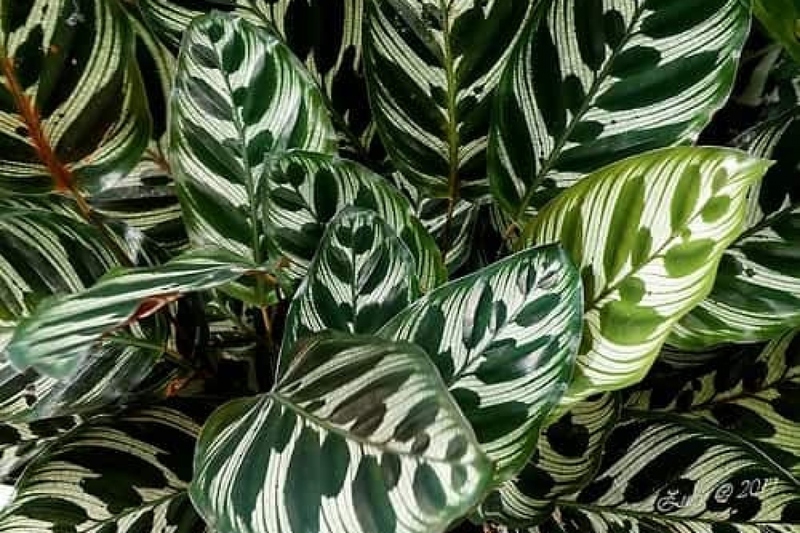 Calathea is a genus of South American tropical perennials with evergreen, rounded, oval or lanceolate foliage perpendicular to the axis of the stem. The flowering is inconspicuous, in clusters of floral tubes. Calathea crocata bears orange flowers. Plant in March your Calathea in a mixture of fibrous soil, dry leaves with a layer of sand at the bottom - no peat, it is a protected resource. Find it a pot of at least three liters with a cup, and place it in a damp, not too bright, between 17 and 21 ° C.
Calathea loves water, the soil must always be wet, so water it every two days during the growing season. In winter, space the waterings. From time to time, clean the leaves with non-calcareous water, it hinders the red spiders. Let the yellowed leaves dry naturally before pulling them off. In summer, add liquid fertilizer for green plants every 2 weeks. You can also add slow release fertilizer pellets to the soil mix when planting or repotting. Stop all fertilizer treatments at the end of summer. At the end of winter every 2 years, repot your plant in a slightly larger pot, adding compost, sand and dry leaves. Calathea multiplies by dividing the tuft during repotting. Select vigorous rhizomes with several leaves, cut them away with a clean knife, and transplant in a bucket filled with moisted potting soil. Place the bucket in a clear freezer bags, to keep it moist, in a black room, at 17 ° C, for a week. When the roots appear, plant in the same mixture as that of your stock plant. Check the leaves: if they are yellowing on the back, it is an attack of red spiders, clean with fresh water. If the leaves turn brown, dry out and curl, the air is too dry, or watering is not important enough. If the leaves are paling, your plant receives too much light.